The updates below consist of changes to the Brightscript code included in channel PKG files as well as changes to the online Instant TV Channel editor tools. The UPDATE button in the Channel List or Theme Editor will apply these changes to your Roku channel. If your channel is already updated to the latest version then the UPDATE button will not be visible. Often new features and corrections will only apply to new Content Items added to your channel, and will not be available for old Content Items unless the item is removed and then re-added to the channel. When uploading a new Pkg file to an already published channel in your Roku Developer Account, it is essential that you increment the Channel Version number shown in your Roku Developer Account. The Channel Version number is used by Roku devices to determine if an already installed channel can be updated to a new version. If you forget to increment the Channel Version number then Roku devices that already have your channel installed will not automatically receive the new version. Always thoroughly TEST new updates using a clone before updating a production channel. This is particularly important when updating from legacy Classic, Vertical, Grid, and Series channel types to SceneGraph. More information about how to update a channel and SceneGraph can be found in Instant TV Channel's Help! section. Instant TV Channel encourages all developers to participate in Roku's OS Beta Developer Program. Visit https://rokutestingportal.centercode.com/welcome/ to sign up. April 17, 2019 Update 470 • Corrected a bug that crashed channels running on devices with a Roku firmware version of less than 9.1 because they do not contain the SignalBeacon function. This update is applicable only to channels using the SDK publishing method, and will only become active after the new package file has been published in your Roku Developer Account. April 16, 2019 Update 469 • Added channel launch time signal beacons to satisfy Roku's September 30, 2019 certification criteria. • Unescaped ShortDescriptionLine1 & ShortDescriptionLine2 in Grids so that "%0a" can be used to force line breaks. • Corrected a bug that prevented grid description bubbles from being displayed under certain circumstances. April 8, 2019 • Added BIF support for MKV source videos. • Added the Send BIF S3 Success Email parameter to the "Account" page to enable the sending of email messages for successful writes of BIF files to S3. The new default setting is for no email to be sent. In case of an error generating a BIF file or writing a BIF file, an email message is always sent regardless of this setting. April 4, 2019 • Added "Wizard" buttons on the "Keys & CDNs" page for S3 Configuration bucket and S3 BIF bucket creation. March 25, 2019 Update 468 • Modified the behavior of the "Create BIF" button on the Content page so that it emails the BIF file if the S3 BIF bucket is not configured. • Corrected a bug that prevented the AllowPause and ChannelAppId options to be ignored for Selectable Banner Ads. The Banner Ad portion of this update will only become active for SDK channels after the new package file has been published in your Roku Developer Account. The BIF portion of this update does not require a new package file and can be used with Direct Publisher channels and with SDK channels. 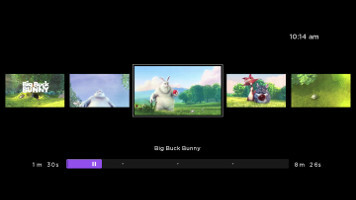 March 18, 2019 Update 467 • Added the "Create BIF" button to Content page video items in order to generate BIF files in support of new Roku testing requirements. The BIF files are created and stored in a pre-configured S3 bucket which is accessed within the channel using the "bif://" prefix. Direct Publisher users will need to change the "bif://" prefix to a less-secure prefix such as "http://s3.amazonaws.com/bucketname/". The BIF interval and image quality is configurable on the "Keys & CDNs" page. Please see the BIF help article for more information. • Corrected a bug that caused the channel to crash if the Theme SpringboardMinuteLabel parameter was blank. • Corrected a bug that caused a fade-in time of 0 to "freeze" the left-right scrolling in Horizontal Lists. • Corrected a bug that caused the mini-progress bars on episodic Horizontal List posters to be displayed incorrectly under certain circumstances. • Corrected a bug that caused some Nielsen-related components to be active even though the Theme RAFNielsenEnabled parameter was disabled.
. • Replaced the missing default value of "actor" for the Direct Publisher Role parameter. • Modified the behavior of the Theme AdPreload parameter so that it controls VAST ad preloading when a Springboard screen is displayed.
. This update will only become active for SDK channels after the new package file has been published in your Roku Developer Account. February 7, 2019 Update 466 • Important: This Update modifies the behavior of the Theme TrailerStyle "off" option. • Important: Channels using the Programmable Button "channel" Function or the video ad ChannelAppId parameter should install this Update. • Added the "no video" option to the four Theme TrailerStyle parameters. The new "no video" option performs the same function as the old "off" option did, by preventing any trailer video from playing. As of Update #466 the "off" option will prevent any trailer video from playing (as it did before) AND it will also prevent the display of any trailer background image or overlay. • Updated the Programmable Button "channel" Function and the video ad ChannelAppId linking function in order to maintain compatibility with the Roku Channel Store. February 4, 2019 Update 465 • Added support for Deep Linking using roInputEvent in order to support new Roku testing requirements. This allows an already running channel to deep link to content in the channel without requiring a channel launch delay. • Added support for Deep Linking to MRSS content. Please see the Deep Linking documentation for more information. • Added trailer-related "irc" MRSS tags. Please see the MRSS Elements documentation for more information. • Corrected a bug introduced several updates ago that prevented the STAR key from activating the Search function in grids. • Corrected a bug that prevented the Vertical List Header parameter from being edited if the Vertical List was located in a Grid Row. January 17, 2019 Update 464 • Added the Theme AdPreload parameter to allow video ad preloading to be disabled. Changing this parameter to "False" may cause delays in video ad playback. • Added the Theme AdStackingLimitMidroll parameter to allow the stacking limit for midroll ads to be adjusted independently of prerolls and postrolls. • Corrected a bug that caused audio streams to crash the channel if the Length was 0 and the remote control fast-forward or rewind button was pressed. January 14, 2019 Update 463 • This update adds a number of new trailer-related features. Please see the Trailer Videos, Backgrounds, and Overlays help article for more information. • Added the Content TrailerName and TrailerUID parameters to Picture, Text, and Programmable Button items. These two parameters allow the items to have Trailer-style videos displayed in their parent lists or grids. Video items have had these two parameters since Update 460. • Added the Content TrailerBackgroundUrl and TrailerOverlayUrl parameters to Video, Picture, Text, and Programmable Button items. These two parameters allow the items to have background images and transparent overlays displayed in their parent lists or grids, as well as on Springboards for Video items. • Added the Content BackgroundImageUrl, BackgroundVideoUID, and BackgroundVideoName parameters to Grids, Grid Rows, Horizontal Lists, Vertical Lists, and MRSS items. These parameters display images or videos in the background of grids and lists. The parameters override the Theme BackgroundImageUrl and BackgroundVideoUIDparameters, and are themselves overridden by Trailer parameters in children. • Added the Content ListTrailerName, ListTrailerUID, ListTrailerBackgroundUrl, and ListTrailerOverlayUrl parameters for grids and lists. These four parameters allow grids and lists to have Trailer-style videos, background images, and transparent overlays displayed in their parent lists or grids. • Added the Theme BackgroundImageUrl, BackgroundVideoName and BackgroundVideoUID parameters. These parameters display images or videos in the background of grids and lists. • Added the Theme BackgroundVideoLoopLimit, and TrailerVideoLoopLimit global parameters to manage bandwidth consumed by looped videos. • Added the Theme BufferPictureOpacity parameter. • Added the Theme PosterScreenPosition parameter which can be used to adjust the vertical position of the posters on a Horizontal List screen. • Added the Theme ShowDebugClientId parameter to display the Client ID. The ShowDebugVersion parameter no longer displays the Client ID. • Added the Theme ShowDebugRida parameter to display the RIDA (Roku ID for Advertisers). The ShowDebugVersion parameter no longer displays the RIDA. • Added the Theme TrailerBackgroundIgnoreVideo parameter which allows Trailer background images to be displayed both before and after trailer background videos instead of only after. If the background image matches the Trailer video's BufferPictureUrl image, this provides the appearance of the Trailer video's buffer picture being displayed a second or two sooner than it otherwise would. • Added the Theme TrailerOverlayOnBufferPicture parameter which allows Trailer overlays to be displayed over buffer pictures when a video is starting. • Added the Theme TrailerOverlayWhenPaused parameter which allows Trailer overlays to be displayed over paused videos. • Re-added support for the Content PlayDuration parameter which has been broken since Roku Firmware/OS 8.1. • Changed the behavior of Springboard posters so that an empty frame is not displayed if no PosterUrl has been provided. • Added the experimental Theme PosterScreenExplode parameter which enables additional Horizontal List poster animation when the poster is selected. Use with care, this experimental parameter may cause channel crashes. • Corrected a bug that prevented ITVC query variables from being expanded into MRSS feed/playlist URLs. • Corrected a bug that displayed a black screen instead of video when passwords were used with Springboard screens. • Corrected a bug that caused the optional Springboard Preview button to ignore the PlayStart parameter. November 16, 2018 Update 462 • Added support for the BufferPictureUrl parameter when used in MRSS Playlists configured as Grid Rows. • Corrected a bug that caused the channel to crash if an In-Channel Purchase was cancelled at the same time that the Roku Channel Store returned an error. November 12, 2018 Update 461 • Worked around a Roku OS "issue" that affected the built-in default 9-patch buffer screens for poster-style video trailers. November 12, 2018 Update 460 • Added support for trailer videos displayed in the selectable posters or in the background of Grid, Horizontal List, Springboard, and Vertical List screens. Trailer videos are specified using the new video item TrailerUID parameter or any existing video item Springboard "Trailer" button. Several new Theme TrailerStyle parameters control whether the trailer is displayed in a poster, in the background, or in a custom location. • Added the Theme BusySpinnerEnabled parameter which may be used to disable or enable the busy spinner without requiring a new Pkg file. • Added the Theme GridBubbleDebounceTime parameter which may be used to reduce the delay before displaying Grid bubbles under certain circumstances. • Corrected a bug that caused the channel to crash during an In-Channel Purchase if the Roku Channel Store returned an error. • Corrected a bug that caused Vertical List Small Icon URLs to be displayed in the Header. • Corrected a bug that caused playlist passwords to be applied to each individual item in the playlist. October 15, 2018 - - - • Updated the free WordPress Registration & Linking example plugin to support PHP 7. Please see the Paid Roku Channels: Registration & Linking with WordPress help article for more information. The updated plugin is available here. September 29, 2018 Update 459 • Added audio support to Picture items. This allows audio content to be playing in the background while a single image is displayed or while a multi-image slideshow is displayed. • Added the Theme VideoPrebufferingEnabled parameter. This is a new parameter for Instant TV Channel that has not been extensively tested yet, however it is expected to reduce video stream loading time under certain circumstances. • Added Theme rsg_version and splash_rsg_optimization parameters to support upcoming Roku firmware releases. • Corrected a bug that allowed HLS streams to restart while the Theme AutomaticPauseTime "Is anyone watching?" dialog box was displayed. September 25, 2018 Update 458 • Added a customizable Rating widget to the video screen. The widget can be enabled, disabled, and configured from the Theme page. Vertical and horizontal wipe-animations with adjustable speeds are supported. • Modified the Theme ShowDebugIfSerialNumber parameter to accept the RIDA (Roku ID for Advertising) and Client ID if the device firmware is 8.1 or higher. • Modified the Theme ShowDebugVersion parameter to display the RIDA (Roku ID for Advertising) and Client ID. If the device firmware version is less than 8.1 then the RIDA and Client ID debug lines will both contain the device serial number. • Replaced the PublisherID and SerialNumber elements for In-Channel Purchase receipts stored in S3 with ClientID and RIDA elements. If the device firmware version is less than 8.1 then the ClientID and RIDA elements will contain the device serial number. • Modified the "%DEVID" macro variable so that it returns the Client ID instead of the device serial number if the device firmware is 8.1 or higher. • Added the "%RIDA" macro variable which returns the Roku ID for Advertising. If the device firmware version is less than 8.1 then the "%RIDA" macro variable will return the device serial number. • Corrected a bug that caused the channel to hang after playing a "Preview" video. • Corrected a bug (again) that caused the channel to crash if a Dropbox URL was used for a poster. The use of Dropbox is not recommended due to Dropbox bandwidth limits. September 5, 2018 Update 457 • Corrected a bug that displayed Vertical List Small Icons (SmallIconUrl) at an incorrect resolution. August 30, 2018 Update 456 • Corrected a bug that causes larger channels (approximately 700 or more items) to crash at launch if the channel contains video ads, the Theme AdStartTime parameter is "0" or "1", and the Theme MrssPreload parameter is "True". August 22, 2018 Update 455 • Corrected a bug introduced in Update #454 that caused a crash if the Theme splash_video parameter was used. August 20, 2018 Update 454 • Corrected a bug that caused a crash if a Dropbox URL was used for a poster. The use of Dropbox is not recommended due to Dropbox bandwidth limits. • Changed the behavior of the old AutomaticPlayControls SDK1 "pause+skip" option so that remote control UP and DOWN allows skipping ahead and back to next or previous video. This provides backwards-compatibility with old SDK1 autoplay lists, but does not affect new autoplay lists. See the How to Configure Automatic Playback help article for more information about the AutomaticPlayControls parameter and autoplay lists. August 6, 2018 Update 453 • Worked around an issue that prevented Programmable Button "Channel" and "Home" Functions from working correctly on all device models. July 25, 2018 Update 452 • Corrected a bug that caused a channel crash if an audio content item had an Album specified but no Artist. July 23, 2018 Update 451 • Corrected a bug that caused a channel crash if an audio content item had a Length of 00:00:00 while Live was "False". July 9, 2018 Update 450 • Modified how plain MRSS feed items are stored in order to support duplicate items in separate feeds. • Added support for all Roku-documented audio stream formats such as "aac", "ac3", "dts", "flac", and others in addition to the already supported "mp3" and "wma" formats. July 2, 2018 Update 449 • Corrected a bug that caused Schedules to drop the final "relative" event, if "relative" events were used. June 18, 2018 Update 448 • Improved the loading speed of channels with large numbers of Video Ads. In order to take advantage of this speed increase the Theme AdStartTime parameter must be set to 2 minutes or more. • Added the Theme BusySpinner_X and BusySpinner_Y parameters to allow the spinner to be adjusted to any postion on the screen instead of being centered. • Corrected a bug that caused the spinner to appear larger on 720p displays than on 1080p or 4k displays. • Corrected a bug that caused a crash if the Keys & CDNs Last.fm API Key parameter was blank and a live audio stream was played. • Changed the behavior of Schedules so that only the remote control BACK key can exit the Schedule, but not the UP key. • Corrected a bug that prevented the optional Schedule countdown screen from responding to remote control button presses. • Corrected a bug that caused video buffer pictures (BufferPictureUrl) to be prematurely removed, causing a blink, if a previous picture was waiting to be faded. • Corrected a bug that prevented the splash screen from obeying the Theme splash_time parameter. June 1, 2018 Update 447 • Added the AdsEnabled parameter to MRSS & Playlist items. This allows video ads to be disabled for specific MRSS feeds or playlists. Only newly-created MRSS & Playlist items will have the AdsEnabled parameter. In order to use AdsEnabled with existing MRSS & Playlist items it will be necessary to copy the old MRSS metadata into a new MRSS or Playlist item, and then delete the old item. May 21, 2018 Update 446 • Added the Content Vimeo Import button to allow Vimeo videos to be imported as individual file URLs and other metadata instead of using "vm://" URLs. This works around the Vimeo API rate limit issue and eliminates intermittent channel outages caused by Vimeo API failures. The Vimeo Import button is located next to the Stream 1 Url of video items on the "Content" page. The button is only present for SDK channels that have a Vimeo Access Token configured on the "Keys & CDNs" page. The button is available to all previous Updates that support Vimeo Access Tokens. • Added the Theme BoxCast Order parameter to select the chronological order of BoxCast videos ("Broadcasts") loaded from BoxCast playlists ("Channels"). Please see the Using BoxCast with Instant TV Channel help article for more information. The BoxCast Order parameter will be active only after the new package file has been published in your Roku Developer Account, and is only applicable to channels using the SDK publishing method. May 18, 2018 Update 445 • Important: SceneGraph channels containing lists with AutomaticPlay = "schedule" should apply this Update. • Added a workaround for an issue that may affect channels which use schedules. This workaround allows scheduled videos to be resumed in-progress which may otherwise be started at the beginning of the video regardless of the scheduled start time. • Added support for BoxCast playlists. Please see the Using BoxCast with Instant TV Channel help article for more information. • Corrected a compatibility issue which under certain circumstances would prevent album and artist name retrieval from SHOUTcast audio servers. • Added an option on the "Keys & CDNs" page to prefer either Artist or Album artwork when using Last.fm for audio metadata. • Improved the startup time for Last.fm metadata retrieval for audio streams. Please see the Audio Streaming with SHOUTcast and Roku help article for more information about audio streaming. May 10, 2018 Update 444 • Corrected an issue with the BoxCast module using a function call that is not present in Roku device OS versions prior to 8.1. Please see the Using BoxCast with Instant TV Channel help article for more information. • Corrected a bug that caused the channel to crash if an MRSS feed did not specify a duration for an item. May 7, 2018 Update 443 • Added support for BoxCast. Please see the Using BoxCast with Instant TV Channel help article for more information. • Corrected a bug that prevented the Search function from being used if Springboards were disabled. April 20, 2018 Update 442 • Added support for MRSS Feeds that contain both MP4 and HLS streams so that the StreamFormat parameter can be used to select the desired format. • Corrected a bug that prevented the backup MRSS poster from being displayed when no poster was present in an MRSS feed. • Caution: MRSS items in Grid Rows can now be configured using DisplayAsSeries to display as a Series List or as a nested Horizontal List. Existing MRSS items in Grid Rows may need to have their DisplayAsSeries parameter set to "True" in order to continue to be displayed as Series Lists. • Renamed the Theme GridScreenOverhangHeightHD parameter to GridVerticalMarginTop. • Added the Theme GridListNameSize parameter to allow the font size of Grid Row Names to be changed. • Added the Theme GridVerticalWrap to control Grid poster scroll wrapping when the top or bottom Grid Row has been reached. • Added a 'Top' description to Grids which can be used alone or with the existing 'Bubble' description. Multiple new Theme parameters (all beginning with "GridTopDescription") have been added to configure the 'Top' description. Please see the Using Roku Grid Screens help article for screenshots and links to sample channels. • Renamed the Theme GridScreenDescriptionVisible parameter to GridDescription and changed the available options in order to support a choice of 'Bubble' description, 'Top' description, both, or none. • Added the Theme GridBookmarkColumn and GridBookmarkRow parameters to optionally force Grids to always start at same row and column on entry. • Added the Theme FontSizeTiny and FontLineSpacing parameters. • Added the Theme DialogBackgroundImage parameter to allow a custom 9-patch image to replace the default purple Dialog background. The Sample Images page contains sample blue and grey 9-patch background images. • Added the Theme MrssShortDescriptionLine2 parameter to allow MRSS feed descriptions to populate the ShortDescriptionLine2 parameter. • Added the Keys and CDNs Vimeo SDL2 Description parameter to allow Vimeo descriptions to populate the ShortDescriptionLine2 parameter. • Added support for unlimited nesting of Horizontal Lists, Vertical Lists, and Grids within Grid Rows. • Modified Deep Linking behavior for Series List "Season" mediaType in order to support new Roku testing requirements. • Added support for small text items for which a color is specified so that a color of "#000000" will prevent the item from being displayed. This can be used to remove the Runtime/Date/Rating line from the Grid 'Bubble' description. • Removed "Screen" from all Theme parameter names starting with "GridScreen" and "ListScreen" in order to shorten excessively long names. This applies to all Update levels, including pre-SceneGraph levels. It has no effect on parameter values or channel operation. This update will only become active after the new package file has been published in your Roku Developer Account. April 2, 2018 Update 440 • Worked around an issue that causes Horizontal Lists to become unresponsive to left and right RC keypresses under certain circumstances. • Added the GridRowStyleCustom_X and GridRowStyleCustom_Y parameters to Grid Rows so that custom poster sizes can be specified. • Added the Theme ListScreenBackgroundPosterOffset parameter which controls the vertical offset of the selectable background poster if the Vertical List ListStyle parameter is set to "vertical-background". March 26, 2018 Update 439 • Free demo channels for new Grid features are available: my.roku.com/add/GRID1 and my.roku.com/add/GRID2. Please see the Using Roku Grid Screens help article for more information about using Grids with Instant TV Channel. • Added GridRowScale and GridRowStyle parameters to Grid Rows. This allows each Grid Row to have different poster sizes and can be used to build "Hero" Grids. • Added support for the Theme GridScreenDescriptionVisible parameter which can be used to disable Grid description bubbles. • Added the Theme GridScreenHorizontalMarginPercent, GridScreenHorizontalSpacing, and GridScreenVerticalSpacing parameters. • Added the Theme GridScreenRowCounter parameter which can be used to disable the Grid row counter. • Removed Theme CounterText Grid parameter. Counter colors are configured using GridScreenListNameColor. • Removed Theme UpBehaviorAtTopRow Grid parameter. Grids continuously scroll at the top and bottom. • Added the Theme splash_extended parameter to work around a Roku firmware issue that may cause a black flash shortly after the splash screen loads. • Changed the way that Vimeo information is displayed when the Theme ShowDebugVideoStatus parameter is set to "yes" so that it is easier to monitor Vimeo rate-limiting. • Added missing support for manually-set Springboard LeftBreadcrumb and RightBreadcrumb. • Corrected a bug that prevented posters with keyed "S3://" URLs from being displayed. • Corrected a bug that prevented SRT subtitle files for video content items older than Update 314 from being displayed. • Corrected a bug that prevented the logo overlay from being displayed if a video exited to the Springboard and then resumed from the Springboard. • Corrected a bug that caused banner ads to disappear under certain circumstances. March 15, 2018 Update 438 • Theme Buffer Bar parameters now control progress buffering bars for all videos. • Custom Buffering Text is now available for all videos instead of only for AutoPlay videos. • Added the Theme BufferPictureUrl parameter which may be used to configure a channel-wide buffer picture for all videos that do not already specify a buffer picture. • Added the Theme OverlayUrl parameter which may be used to configure a channel-wide bug/logo overlay image for all lists that do not already specify an overlay. • Added Theme BufferText (Buffering Text) parameters which may be used to configure channel-wide buffering text options for all lists that do not already have these options specified. • Cleaned up unused SDK1 parameters and descriptions. February 27, 2018 Update 437 • Corrected a bug that caused duplicate subtitle track names to appear on the Roku Accessibility - Captioning Track screen. February 22, 2018 Update 436 • Caution: This update adds support for logo bugs specified with the HDOverlayUrl parameter which is available in any Horizontal List, Vertical List, or Series List. In previous updates the logo bug specified by HDOverlayUrl could only be displayed in AutomaticPlay-enabled Lists. As of this update the logo bug specified by HDOverlayUrl can be displayed in video items in any List type. Existing channels may need to set the Theme OverlayEnabled parameter to "False" in order to prevent the Instant TV Channel logo bug from being displayed if the default value of any HDOverlayUrl parameters have not been cleared. • Added the Theme Font parameter and associated size parameters to allow a custom TrueType font to specified. • Added an automatic low-memory check before displaying background images. • Added the Theme MemoryCheckEnabled parameter to disable the automatic device memory check and allow memory-consuming features to be enabled on low-memory devices. • Added the Theme AdPodLimit parameter to limit the maximum number of ads in an AdPod. Default value is "0" which allows any number of ads. • Added the Theme AdMidrollInterval parameter as an alternative to configuring midroll positions separately for each video. • Improved VAST ad processing time when using large weights. • Added the Theme KeyboardNormalText and KeyboardHighlightText parameters for Password and Search keyboard text colors. • Improved visibility of the highlighted symbol on the Password and Search keyboards. • Removed most "SD" parameters from Content items. Content items created prior to this Update may still have "SD" parameters although these parameters are ignored and can be left blank. Theme "SD" parameters are still required. • Corrected a bug the caused schedules to fail if a filler was interrupted to play a scheduled video. February 8, 2018 Update 435 • Corrected a bug that caused Registration and Linking to pause indefinitely if Registration was enabled on the top-level folder of a channel. February 7, 2018 Update 434 • Re-added support for splash_screen_sd and mm_icon_focus_sd to avoid Static Analysis errors. • Improved randomization of Registration and Linking registration codes. • Corrected a bug that caused Registration and Linking to crash if a Partner ID was not provided. February 5, 2018 Update 433 • Corrected a bug that caused a crash when Registration and Linking is used with Google Analytics. • Added Deep Linking support for audio-only content items. January 26, 2018 Update 432 • Added the Theme BackgroundImage and BackgroundImageOpacity parameters to support a channel-wide background image. January 23, 2018 Update 431 • Corrected a bug that caused AutomaticPlayControls to always be "full" regardless of the actual setting. • Corrected a bug that caused AutoPlay lists to be exited early if an Intro or Outro was played. January 22, 2018 Update 430 • Added support for Banner Ads. • Corrected a bug that prevented content caching if Theme MacrosEnabled was set to "False". January 17, 2018 Update 429 • Added workaround for Roku OS update that prevented video linking-ads from transferring control to the target channel. • Corrected a bug that caused videos with %NULL or # as the stream URL to display an error message instead of behaving as a zero-length video. • Corrected a bug that caused the video ad AdBufffering parameter to be ignored. • Corrected a bug introduced in Update #428 that caused a channel to crash when attempting to display a banner ad. Banner ads are not yet supported, but will likely be re-added in the next update. January 15, 2018 Update 428 • Added support for simple Splash Videos on the Theme page. Only available for "Commercial" channel types. • Added support for Periscope.TV live streams. January 10, 2018 Update 427 • Added support for Intros and Outros. • Disabled the Right-Directional button for live streams without transport controls. January 4, 2018 Update 426 • Added support for Subtitles. Subtitle selection is controlled by the remote control STAR ("Option") button. • To meet new Roku certification requirements, fast-forward and rewind controls are disabled when Live is set to "yes", but can be re-enabled by setting Live to "yes+controls". January 1, 2018 Update 425 • Converts existing Classic, Vertical, Grid, and Series channel types into SceneGraph channels. Please review What Is SceneGraph? before updating Classic, Vertical, Grid, or Series channel types. • Added support for Registration & Linking. • Corrected a bug that caused Scheduled Playlists to display a black screen instead of video. December 22, 2017 Update 424 • Corrected text screen OK button appearance. • Updated support for Brightcove HLS streams. • Added Theme MrssPreload parameter to allow background MRSS feed and CDN/OVP playlist preloading to be disabled. • Added Keys & CDNs Brightcove ListPoster parameter to control which Brightcove assets ("Poster" or "Thumbnail") are used for List Posters. Previously the larger Brightcove "Poster" assets were always used for ListPosters. The default Brightcove ingest profile setting for the "Poster" assets may cause performance problems or instability on lower-end Roku devices. • Corrected a bug that caused a crash if Google Analytics was enabled while an audio stream was played. December 15, 2017 Update 423 • Corrected a bug that caused URL-specified overhang artwork to be displayed incorrectly under certain circumstances. • Added the Theme FadeInTime, FadeOutTime, and BufferBarFadeInTime parameters. December 14, 2017 Update 422 • Corrected a bug in the MRSS parser. • Added the Theme MrssMaximumItems parameter. Default value is 50 items. Does not affect Vimeo playlists which are still limited to 50 items maximum. December 12, 2017 Update 421 • Corrected a bug that caused a crash if Theme MacrosEnabled was set to False and no macros were present. • Corrected a bug that caused a crash when attempting to display a receipt for an item with a free trial period. • Corrected a bug that prevented All Items Product IDs specified on the Roku Billing page from being purchasable. • Corrected behavior of Springboard Purchase button Button Display parameter. Previously the Purchase button would always be displayed if no Product Identifier was specified even though the Button Identifier was purchased. December 4, 2017 Update 420 • Added Theme parameter BusySpinner to support custom busy spinner artwork. The Developer Mode parameter on the Account page must be changed to "Advanced" in order to use this parameter. • Corrected a bug that caused the busy spinner to be displayed incorrectly on Text screens. November 27, 2017 Update 419 • Added support for Vertical Lists. • Display additional debugging information if Theme parameter ShowDebugInfo is enabled. • Added support for Deep Linking with free and paid content in the same channel. • Corrected the behavior of Breadcrumbs on Springboard screens so that the names of the previous two levels are displayed. • Corrected a bug in the processing of multiple Director names on the Springboard. • Corrected a bug affecting the operation of the "Top" and "Restart" Programmable Buttons. November 17, 2017 Update 418 • Corrected a bug that prevented the TitleSeason parameter from being displayed in the Springboard. • Added support for Breadcrumbs to improve backward compatiblity with Legacy SDK. • Added Theme MacrosEnabled parameter to allow macro processing to be disabled in channels that do not use macros. November 8, 2017 Update 417 • Corrected the behavior of Deep Linking mediaType "season" so that the parent list of the selected video is displayed instead of immediately playing the video. • Added GridScreenBackgroundPosterOpacity and GridScreenFocusBorderColor parameters to the Theme page. • Added support for Grid background posters based on the focused poster. To enable Grid background posters set the Theme GridScreenBackgroundPosterOpacity parameter to a non-zero value. • Removed various unused SD parameters from the Theme page. November 6, 2017 Update 416 • Added support for passwords. • Loading speed improvement for large MRSS & playlist-based grids. November 4, 2017 Update 321 (Legacy) • Bugfix for Roku OS 8.0 issue preventing Vimeo (and other CDN) playlists from loading. This issue is not present in SceneGraph (Update 400 or higher) versions. October 29, 2017 Update 415 • Corrected a bug that affected the Content AdsEnabled and Theme BufferPictureEnabled parameters in older Updates. October 26, 2017 Update 414 • Added new debugging support using Theme ShowDebug... parameters. • Added support for CloudFront-hosted configuration files. • Added AutomaticPlay support to Series Lists and MRSS Playlists. • Added support for Brightcove analytics. • Corrected a bug where the "ordered" AdOptimize option was not recognized. October 16, 2017 Update 413 • Added support for Brightcove CDN. The newer Brightcove "Policy-Key" authentication method is being used now. Brightcove is discontinuing support for the "URL-Enabled Authentication Token" method as of January 1, 2018. For existing channels using Brightcove it will be necessary to provide a "Policy-Key" generated from your Brightcove account. Please see the Using Brightcove with Instant TV Channel help article for more information about using Brightcove with Instant TV Channel. October 11, 2017 Update 412 • Added new Theme BufferPictureEnabled parameter which replaces the obsolete BufferPictureVideoScreenEnabled parameter. This parameter can be used to globally disable all buffer pictures, even if BufferPictureUrl parameters are specified. • Added support for Theme BufferPictureTextEnabled parameter. This parameter can be used to globally disable text that would otherwise be displayed on top of buffer pictures. • Removed obsolete Theme BufferPictureAfterMidrollEnabled parameter. The buffer picture, if present, is always displayed after midrolls. • Removed obsolete Theme BufferPictureVideoScreenDelay parameter. This delay was a workaround for an SDK1 bug. • Removed obsolete Theme OverlayVideoOnly parameter. The logo or "bug" overlay, if provided, is always present on video screens. • Corrected problem (again) with preroll ads playing when a bookmarked video started. October 10, 2017 Update 411 • Added support for Google Analytics. October 9, 2017 Update 410 • Improved grid loading speed. • Added support for Vzaar CDN. • Update, repackage and upload to your Roku Developer Account are required to add this update to your Roku channel. This update will only become active after the new package file has been published in your Roku Developer Account. October 2, 2017 Update 409 • Added support for Deep Linking. • Corrected problem that prevented ads from being disabled for specific videos. • Corrected problem with ad repeat limit not being obeyed. • Corrected problem with preroll ads playing when a bookmarked video started. • Corrected problem with HD videos not playing on low-memory devices caused by unpatched Roku OS bug. September 25, 2017 Update 408 • This is the first SceneGraph version. Currently SceneGraph is only available for NEW channels. A SceneGraph update for all existing channels will be available soon. • Existing Classic, Vertical, Grid, or Series channels can be converted to SceneGraph on a case-by-case basis. Please contact for more information. March 30, 2017 Update 320 • Changed the behavior of the remote control STAR key initiated Search function so that it behaves the same as the Springboard and Programmable Button initiated Search function. From a Springboard screen found by the Search function, the remote control BACK key will now return to the Search screen. • Changed the naming convention for Pkg files so that the Instant TV Channel Update number (for example "320") is included in the automatically-generated filename. • Update, repackage and upload to your Roku Developer Account are required to add this update to your Roku channel. This bugfix will only become active after the updated package file has been published in your Roku Developer Account. March 7, 2017 • Added support for embedding Roku-specific Direct Publisher parameters within the Instant TV Channel Notes or Description parameters. This allows older (created before February 9, 2017) items that do not contain Direct Publisher parameters to be used within Direct Publisher channels. The format is identical to that used to embed Roku parameters in Vimeo descriptions. March 6, 2017 • Added support for embedding Roku-specific parameters within the Vimeo description field. Please see the Using Vimeo with Instant TV Channel help article for more information about using Vimeo with Instant TV Channel. • Corrected a bug that prevented individual Vimeo videos (not albums) from appearing in automatically-generated categories if a DirectPublishId value was not provided for the video. • This bug fix only affects Direct Publisher channels that use individual (not in albums) Vimeo videos. February 21, 2017 Update 319 • Corrected a bug that incorrectly caused autoplay behavior in non-series lists if the Springboard was disabled. This bug only affects channels that have the Theme SpringboardEnabled parameter set to "False". February 18, 2017 Update 318 • Corrected a bug introduced in Update #314 that prevented streams from playing on SD displays if more than one bitrate rendition was provided. February 16, 2017 • Modified splash screen handling for "Free" and "Unlimited" channel types to comply with new Roku requirements. The full-screen "Created using Instant TV Channel" splash screen has been replaced with an overlay containing an "Instant TV Channel" message on the lower portion of the splash screen. • It may be necessary to change custom splash screen artwork for "Free" or "Unlimited" Roku channels. Please review the new splash screen before submitting any channels for approval. • Repackage and upload to your Roku Developer Account are required to replace the splash screen in your "Free" or "Unlimited" Roku channel. • This change applies to ALL Instant TV Channel Updates. A channel update is NOT required. February 12, 2017 Update 317 • Minor update to add support for Credits and ExternalIds to Direct Publisher Series Lists. • Removed default Direct Publisher description text to improve the usability of Vimeo Parameter Override with Direct Publisher channels. Please see the Using Vimeo with Instant TV Channel help article for more information about using Vimeo with Direct Publisher channels. • Repackage and upload to your Roku Developer Account are NOT required, but any Direct Publisher channels that include Series Lists many need be regenerated if you use production credits or external IDs in your Series lists. February 11, 2017 • Minor update to correct Direct Publisher feed generation for series. • Repackage and upload to your Roku Developer Account are NOT required, but any Direct Publisher channels that include Series Lists should be regenerated. February 9, 2017 • Added support for Direct Publisher channels. There is now a icon on the Channels page that generates a Direct Publisher feed for any existing or new channel. Please see the How to Create a Direct Publisher Roku Channel walk-through for more information. February 7, 2017 Update 316 • The Theme DeepLinking options are now visible for both "Basic" and "Advanced" developer modes, and the Deep Linking Content UID is always displayed below the poster on the Content page. • Repackage and upload to your Roku Developer Account are NOT required. February 4, 2017 Update 315 • Due to Roku requiring that deep linking support is present in all public channels, the Theme DeepLinking options are now available for all channel types instead of only for the "Commercial" channel type. January 30, 2017 Update 314 • Added support for multiple subtitle tracks specified for video items on the Content page. • Added support for "dash" StreamFormat. • Changed the behavior of macros so that more than one macro substitution can be applied at a time to an individual item. • Changed the behavior of the Theme BufferPictureTextEnabled parameter so that it only applies to non-autoplay videos and to autoplay videos with AutomaticPlayControls="Full". The BufferPictureTextEnabled parameter is usually set to "False". • Corrected a bug that prevented videos from being used with banner ads unless IgnoreVideoAdsEnabled was set to "True". • Corrected a bug that caused the channel to crash if Vimeo responded with an HTTP error for a vm-style URL. • Corrected a bug that caused the AudioLanguageSelected parameter to be overriden by the device language selection. • Corrected a bug related to Series Lists in Grid Rows that caused a crash under certain circumstances. • Corrected a bug that prevented Trailer buttons from being used. • Update, repackage and upload to your Roku Developer Account are required to add this update to your Roku channel. New features in this update will only become active after a new package file has been published in your Roku Developer Account. September 26, 2016 Update 313 • Corrected a bug related to CloudFront invalidation keys on the Keys & CDNs page. September 12, 2016 Update 312 • Added AWS CloudFront Configuration Acceleration to the Keys & CDNs page. Using CloudFront will greatly improve channel startup time for customers that have poor Internet connectivity to the AWS S3 "US East" region. • Allow modification of Configuration Storage S3 keys while they are in use. This allows key replacement, and allows easy migration of the configuration bucket contents to a different AWS account. Incorrectly modifying Configuration Storage S3 keys or bucket contents may cause a Roku channel to stop working. • Added support for percent-style escape sequences within macros. Please see the Changing URLs using a Macro help article for more information about using macros in Instant TV Channel. August 29, 2016 Update 311 • Added beta support for Periscope live streams. Videos only display in portrait mode, video rotation is not supported by Roku. This feature may eventually stop working if changes are made by Twitter to Periscope systems. • Added In-Channel Purchase support to MRSS items. All items in an MRSS Feed or Playlist will have the same Product Identifier. • Added MRSS Actors, Director, Ratings, and Categories to MRSS Feed and PlayList items. See the Using MRSS Feeds and Playlists and MRSS Elements help articles for more information. • Added the Video Content Item AudioLanguageSelected parameter. • Added the Video Content Item EncodingType and EncodingKey parameters for PlayReady DRM support. • Added the Video Content Item VideoAdsEnabled parameter so that video ads can be disabled for individual videos. • Changed the behavior of the Search function when initiated from a Springboard button or a Programmable Button so that multiple consecutive searches are possible. • Added the Theme ShowDebugIfSerialNumber parameter to restrict the visibility of debug screens to Roku devices with specific serial numbers. • Added the Theme BufferBarDirection parameter to support vertical and backwards (right-to-left) moving buffer bars. • Added the Theme AudioUserAgent parameter for additional compatiblity with TuneIn and SHOUTcast audio streams. • Perform query variable substitutions on URLs before passing to Google Analytics. Previously URLs were sent to Google Analytics before any query variable substitutions were made. • Modified the behavior of Google Analytics so that it records video content IDs under "Event Label". Previously the "Event Label" value was the same as "Event Action" for most events. • Google Analytics debug screens are displayed if ShowDebugInfo is set to "yes". • Added the "%DHEIGHT", "%DWIDTH" and "%EXTERNALIP" query variables for use with VAST ad tags. See the Query Variables help article for more information. • Added the "goto" Springboard button which supports jumping to any location within the channel. • Added the "play all" Springboard button for video/audio content items which supports auto-play of all videos in a List or Grid Row. • Added the "goto" option to the Programmable Button Function parameter to support jumping to any location within the channel. • Added the "deeplink" option to the Programmable Button Function parameter to support jumping to content items within other Roku channels that support Deep Linking. • Modified Programmable Buttons to allow conditional execution based on the new Condition parameter. Please see the Programmable Buttons for Roku Channel Automation help article for more information on Programmable Buttons. • Modified the DoNotDisplay parameter to allow conditional hiding of items based on the new Condition parameter. This is useful for creating staging areas that are visible only to Roku devices with specific serial numbers, or to hide content items before, after, or between specific dates and times. • Added Intro and Outro parameters for individual Video/Audio items and MRSS/Playlist items. Intros and Outros can be any list or content item in the Content Tree. • Added the ability to drag-and-drop Content Tree icons instead of cutting-and-pasting UIDs for Springboard Trailer buttons, for the new Springboard "goto" button, for the new Programmable Button "goto" function, and for the new Video/Audio Content Item Intro and Outro parameters. • Changed the Video Content Item Rating parameter to allow any text to be used as the rating. • Changed the behavior of left-right Springboard scrolling so that the Springboard screens for Series Episodes can be scrolled through. • Corrected a bug that prevented series bookmark bars in playlists from being displayed properly. • Optimized Vimeo API requests to reduce Vimeo rate limiting. New Vimeo Rate Limiting debug screens are displayed if ShowDebugInfo is set to "yes". • Added the Vimeo "Maximum Width" and "Maximum Height" parameter on the Keys & CDNs page to work around Vimeo 4K encoding problems or to limit Vimeo bandwidth. • Added Control items and support for simple substitution-type macros for text and URL parameters. • Added the Video Item FPS parameter to provide support for 60FPS streams. June 10, 2016 Update 310 • Changed the behavior of AutoPlay lists with mode "Once" so that the first item in the list is played when reentering the list after previously exiting from the final item in the list. This prevents AutoPlay-Once lists from becoming trapped at the final item in the list. • Changed the behavior of nested AutoPlay lists to allow the remote control REWIND key to traverse the complete list hierarchy in the reverse direction. This allows multiple nested AutoPlay lists, including MRSS playlists, to behave as a single large AutoPlay list. May 31, 2016 Update 309 • Updated Vidillion video ad support to Vidillion SDK version 1.6.7. • Corrected a bug in AutomaticPlayRandomize that caused the 1st video in the playlist to be repeated under certain conditions. See the How to Configure Automatic Playback help article for more information about randomizing autoplay lists. May 5, 2016 Update 308 • Corrected the operation of the Theme AdStackingLimit parameter so that it does not apply to ads with AdType ending in "2". • Modified Google Analytics to use HTTPS URLs. See the Google Analytics for Roku Channels help article for more information about using Google Analytics. April 9, 2016 • Corrected a bug that prevented Springboard button labels from being edited in video and audio items that were created prior to Update #285. • An update is not required, however you must repackage and upload the channel to your Roku Developer Account in order to correct this bug. This bug fix will only become active after the new package file has been published in your Roku Developer Account. March 21, 2016 Update 307 • Added the Theme AdStackingLimit parameter. Please see the Placing Advertisements in your Roku Channel documentation for more information. March 4, 2016 Update 306 • Increased maximum image upload size from 512K to 1024K in order to better support FHD (1920x1080) splash screens. Use with caution, larger images may exceed the 2048K Pkg maximum file size. Roughly 200K is reserved for code, the balance can be used for images. • Updated Vidillion video ad support to Vidillion SDK version 1.6.6. February 29, 2016 Update 305 • Added the NielsenEnabled and NielsenGenreDefault Theme parameters, and the NielsenGenre Video Content Item parameter to support Nielsen DAR (Nielsen Digital Ad Ratings). • Added support for using Brightcove "Custom Fields" to specify an external SRT subtitle/caption file for Brightcove videos. Please see the Using Brightcove with Instant TV Channel help article for more information. • Added the Theme AutomaticPlayRandomize parameter to randomize AutomaticPlay-enabled lists. • Added support for using more than one Vimeo account with Access Tokens in a single channel. Access Tokens can now be specified in each Vimeo URL. Please see the Using Vimeo with Instant TV Channel help article for more information. • Added the AutomaticPlayTextPrefix and AutomaticPlayTextSuffix parameters to the options available for AutomaticPlay-enabled lists. • Added the "search" option to the Programmable Button Function parameter. Please see the Programmable Buttons for Roku Channel Automation help article for more information. • Added the Theme splash_fhd parameter for 1920x1080 (1080p) splash screens. • Removed Theme splash_sd_x, splash_sd_y, splash_hd_x and splash_hd_y parameters. • Increased maximum image upload size from 200K to 512K. Use with caution, larger images will increase the Pkg file size. • Allow VAST ads to be optionally paused using the AllowPause parameter. • Corrected a compatibility issue that intermittently prevented COMPLETE trackers from being generated for RAF-Partial video ads. • Worked around a bug that intermittently caused duplicate trackers to be generated for RAF-Partial video ads. • Worked around a bug that caused a channel to freeze under certain circumstances if the CDN generated continuous HTTP errors. • Corrected a bug that occasionally caused a channel crash if a content item was being edited while the same content item was being viewed. • Capitalized default Springboard button labels in Theme editor to reduce "P3" complaints from Roku QA. • Changed the default value for the Theme BufferPictureScreenDelay parameter from "0" to "2000" to reduce problems with Roku TV and stick devices that intermittently display a black screen instead of video when the SD and HDBufferPictureUrl parameters are used. If no instances of AutomaticPlayControls are set to "full", then BufferPictureScreenDelay can be safely set to "0". • Update, repackage and upload to your Roku Developer Account are required to add this update to your Roku channel. November 17, 2015 Update 304 • Added 'repeat no exit' as an AutomaticPlay option for MRSS content items. • Corrected a bug that caused the splash_video parameter to interfere with VAST video advertisements. October 27, 2015 Update 303 • Corrected a bug introduced in Update #302 that prevented Brightcove playlists from loading. October 18, 2015 Update 302 • Added the MRSS trackidsubtitle parameter and custom XML tag to allow access to EIA-608 subtitles with MRSS/XML playlists. See the Using MRSS Feeds and Playlists and MRSS Elements help articles for more information. • Added support for Brightcove Cue Points in order to support midroll video ads in Brightcove content. See the Using Brightcove with Instant TV Channel help article for more information about using Brightcove as your CDN. • Improved the loading process for Vimeo playlists. See the Using Vimeo with Instant TV Channel help article for more information. October 9, 2015 Update 301 • Changed the default value of the Roku Advertising Framework IncludeRAF parameter to "False" for compatibility with Legacy Devices (Roku devices manufactured prior to July 2011). • Update, repackage and upload to your Roku Developer Account are required only if you modify the value of IncludeRAF. September 21, 2015 Update 300 • Added support for the Vzaar video platform. See the Using Vzaar with Instant TV Channel help article for more information. • Removed NWM as a VASTMode video ad processing mode option and the default has been changed to "RAF-Full". September 10, 2015 Update 299 • Corrected a bug that caused the channel to crash if Google Analytics was enabled while VASTMode was set to "RAF-Full". • Prevent interactive and other non-MP4 and non-HLS video ads from being requested if VASTMode is set to "RAF-Partial". Interactive video ads currently require that VASTMode be set to "RAF-Full". August 31, 2015 Update 298 • Added the MRSS midrolls tag so that video advertisement midroll positions can be specified in MRSS feeds. See the Using MRSS Feeds and Playlists and MRSS Elements help articles for more information. • Allow URLs to be used for the Theme ListItemHighlightHD and ListItemHighlightSD parameters for Vertical Lists. Previously URLs could be specified in the editor but they were not used by the channel unless they were moved into the Pkg file. August 20, 2015 Update 297 • Corrected a bug that under certain conditions caused the background color to change when an In-Channel Purchase occurred. August 14, 2015 Update 296 • Corrected a bug that caused incorrect bitrate selections for larger (approximately 1GB or more) Viddler and Vimeo video streams when using ABR shortcut URLs like vr://, vm://, etc. July 28, 2015 Update 295 • Added the All Items Product Id and All Items Purchase Type parameters to the "Roku Billing Settings" screen to allow up to two Product IDs and Purchase Types to be applied to all content items in the channel without having to specify them individually for each item. Additional Product IDs and Purchase Types can still be assigned to individual content items. • Added the IgnoreInChannelPurchase parameter to Video Content Items. When set to "True" this parameter causes any In-Channel Purchasing parameters that would normally apply to the item to be ignored, allowing the item to always be available without a purchase. Any Purchase buttons configured for the item are still displayed. • At Roku's request, changed In-Channel Purchase user data collection so that only email address, first name and last name are collected. July 16, 2015 Update 294 • Modified the Search function so that individual Series episodes are searched if the parent Series does not match the search query. Previously individual Series episodes were never searched. July 7, 2015 Update 293 • Corrected a bug that prevented the display of individual video runtimes for Brightcove, Viddler and Vimeo playlists used as Grid Rows. July 2, 2015 Update 292 • Reduced the loading time of Vimeo Albums, Portfolios, and Channels. See the Using Vimeo help article for more information. • Modified the behavior of Vimeo Album and Portfolio feeds/playlists so that they appear in the Roku channel in the same order as when "Manually" arranged in the Vimeo account. Previously the playlist was always displayed in order from newest to oldest video. • Modified the behavior of Grids so that when returning to a Grid after navigating left or right between Springboard screens the Grid item corresponding to the most recently viewed Springboard screen is highlighted. Previously the orginally selected Grid item was re-selected. June 18, 2015 Update 291 • Corrected a bug that caused a crash if Search was enabled and the Search (STAR) key was pressed while viewing a Picture Screen item in an AutoPlay List. June 12, 2015 Update 290 • Added support for loading Vimeo videos and metadata by ID by using a vm:// URL. • Added support for loading Vimeo albums, portolios and channels as MRSS playlists. See the Using Vimeo help article for more information. • Added the Theme AutomaticRestartTime parameter to allow content lists to be periodically reloaded on unattended Roku devices. • Added the Programmable Button "restart" function to allow content lists to be programmatically reloaded on unattended Roku devices. June 1, 2015 Update 289 • Added support for Roku Advertising Framework ("RAF") for VAST video ads. • Added the Theme VASTMode parameter to select between Nowhere Man (NWM) and Roku Advertising Framework (RAF-Partial and RAF-Complete) VAST support. NWM is the original VAST version that has been supported by Instant TV Channel since Update #182. NWM and RAF-Partial support the AdBuffering, SDBufferPictureUrl, HDBufferPictureUrl, and BufferPictureTimer parameters for custom ad buffering screens. RAF-Complete uses RAF's built-in ad buffering screens. • Added the Theme IncludeRAF parameter to allow RAF code to be removed from the Pkg file to provide compatibility with "legacy" Roku devices. • Added the Theme DeepLinkingSpringboardEnabled parameter to allow the Springboard to be shown prior to playing a video launched with Deep Linking. If left at the default value of "False" then the Deep Linking video will be played immediately without displaying a Springboard. • Added 12 new Theme parameters related to modifying the Focus Outline and Description Background on Grid screens. See the Using Roku Grid Screens help article for more information and a brief walk-through. • Increased the maximum Pkg file size to over 1500K. • Corrected a bug introduced in Update #285 that crashed the channel if an audio/MP3 stream was played. May 18, 2015 Update 288 • Added mkv, mka, and mks as options to the StreamFormat parameter in all content items. • Corrected a bug that caused the channel to crash when an item was selected if SpringboardEnabled was "False". May 12, 2015 Update 286 • Corrected a bug that caused the channel to crash when an item in a grid was selected. Update 285 replaces several Theme parameters related to Springboard (detail screen) button labels. Labels for audio and video buttons with similar functions have been replaced with a single combined label parameter. If you have previously customized any button labels you will need to re-enter your custom values for the new Theme parameters after upgrading. You should consider making a clone of your channel before upgrading in order to be able to refer back to the original values if needed. • Springboard buttons are now user defined, and can be added, removed and positioned separately for each content item. Default button labels are still defined in the Theme editor, but each button label can be individually changed within the Content editor. Only Video/Audio Content Items added on or after Update #285 have user-definable Springboard buttons, earlier content items still have pre-positioned Springboard buttons. • Added optional "Preview" and "Trailer" Springboard buttons. • Per Roku's request, support has been added for the "In-Channel Purchase" method of purchasing or upgrading content. This feature can be used with Programmable Buttons or with user-defined Springboard buttons. See the In-Channel Purchase help article for more information on how to use this feature with your Roku channel. • Per Roku's request, support has been added for Deep Linking using two new Theme parameters. Deep Linking can be enabled by setting the Theme DeepLinkingEnabled parameter to "True". Video ads within Deep Linking content can be enabled or disabled using the Theme DeepLinkingAdsEnabled parameter. Deep Linking video ads must be located within the same parent list as the Deep Linking video content. • Added the Theme Editor EraseBookmarks parameter which can be used for testing or to permanently dieable bookmarks within a channel. • Added the Theme Editor ShowDebugIcp and ShowDebugStoreCatalog parameters which can be used for testing In-Channel Purchasing. • Added automatically generated comments for video ad RepeatLimit, StartTime, and Weight parameters and for In-Channel Purchase Product Identifier parameters. • Corrected a bug that caused series episode progress bars to be displayed incorrectly. • Corrrected a bug that caused a autoplay BACK request to be lost if a postroll ad was present. • Corrrected a bug that caused the position in a parent list to be lost under certain conditions if a child was a Series List. March 12, 2015 Update 283 • Per Roku's request, support has been added for the "In-Channel Upgrade" method of upgrading a Roku channel. This supplements the existing Programmable Button "Channel" option that allows multiple new channels to be installed from within an already-installed channel. The In-Channel Upgrade option supports automatic deletion of the pre-upgrade channel, but is restricted to a single upgrade channel for each pre-upgrade channel. Both options integrate with Roku Billing Services. See the In-Channel Upgrade help article and the Programmable Buttons help article for more information on how to use this feature with your Roku channel. March 2, 2015 • Updated the Wowza Live Streaming walk-through help article to cover Wowza Streaming Engine and Wowza Streaming Cloud version 4.1. February 23, 2015 Update 282 • Corrected a bug that caused the video to be all black (but sound was OK) if an invalid SDOverlayUrl or HDOverlayUrl logo URL was provided. • Corrected a bug that caused the remote control to become non-responsive if passwords were used with SpringboardEnabled set to "false" and a valid password was not provided by the viewer. • Added new query variables %ADVERTISINGID, %CHANNELID, %CHANNELTITLE, %CONTENTID, %CONTENTTITLE, %COUNTRYCODE, %ISADIDTRACKINGDISABLED, %PUBLISHERID and %USERID. See the Query Variables help article for more information. January 19, 2015 Update 281 • Worked around a Roku 6.1 firmware compatibility issue that prevented Dropbox from being used for poster storage. • Worked around a Roku 6.1 firmware compatibility issue that intermittently prevented BufferPictures from being used in specific situations. • Removed unnecessary "Please Wait" messages that were displayed when loading the Springboard/Detail screens for live audio content. January 16, 2015 • Roku's recently released 6.1 firmware update causes excessive playlist loading delays to occur in Instant TV Channel Updates #264 and earlier. This bug was eliminated in June 2014 with Instant TV Channel Update #265. If your channel uses playlists and is at Update #264 or earlier you may need to update now. • Roku's recently released 6.1 firmware update may cause playback problems for some HLS streams. Setting your HLS stream's Bitrate parameter to "0" may resolve this issue. HLS streams should usually have the Bitrate parameter set to "0" because the HLS metadata already contains bitrate information. Please visit the Roku Developer Forum for more information: http://forums.roku.com/viewtopic.php?f=34&t=82277. January 12, 2015 Update 280 • Added support for Brightcove API responses that simultaneously contain HLS and MP4 streams. Previously a channel would only recognize the MP4 streams when a Brightcove response contained a combination of HLS and MP4 streams. December 29, 2014 Update 279 • Added support for video content stored on Viddler. See the Using Viddler with Instant TV Channel help article for more information about using Viddler as your CDN. • Added support for Brightcove VOD HLS content. See the Using Brightcove with Instant TV Channel help article for more information about using Brightcove as your CDN. • Corrected a bug that caused the audio buttons on Springboard/Detail screens to stop responding after the Search button was pressed. • Corrected a bug that caused the channel to crash if a Brightcove API call did not return a stream URL. December 12, 2014 Update 278 • Added the Slideshow parameter to Picture Screen content items. Allows a directory of images to be provided instead of an image URL. The specified directory must support indexing or listing. • Added support for Registration & Linking to video items contained in AutomaticPlay-enabled and Scheduled lists. November 22, 2014 Update 277 • Added support for LiveRail video ads. Please contact before attempting to use LiveRail video ads. November 20, 2014 Update 276 • Updated VAST related code to Roku Ads version 1.1b177. Includes improved handling of redirected trackers. • Added the Content Editor AllowPause parameter for video ads. • Removed the Content Editor AllowSkip parameter for VAST and Vidillion video ad types. See the Placing Advertisements in your Roku Channel help article for more information about using video ads in your Roku channel. • Changed the behavior of Horizontal and Vertical Lists so that when exiting from a Springboard screen the focused item in the List corresponds to the most recently viewed item in the Springboard screen. Previously, if the remote control LEFT or RIGHT button was used in the Springboard screen, when returning to the parent List the originally selected child item was still in focus instead of the new child item selected by the LEFT or RIGHT button. • Changed the behavior of selectable banner ads so that the previously focused Horizontal List item is brought into focus again after the video ad has completed. • Corrected a bug in episodic list progress bars that previously required having to exit and then re-enter the list in order to update the progress bar. • Corrected a bug in the Springboard screen that caused the displayed Release Date and Length to gradually shift to the right. • Corrected a bug that prevented the overlay image or logo bug from being displayed over buffer pictures. This behavior can be changed using the Theme Editor OverlayVideoOnly parameter. • Modified the Search function to include Text and Picture screens in search results. • Added customizable buffering progress bar support for all buffer pictures displayed using the SDBufferPictureUrl or HDBufferPictureUrl parameters. • Reduced the number of events recorded using Google Analytics in order to improve accuracy by reducing data loss caused by rate-limiting. See the Google Analytics for Roku Channels help article for more information about using Google Analytics. October 2, 2014 Update 275 • Corrected a bug that prevented secure s3:// URLs from being used for Picture Screen items. See the Using Amazon S3 for Secure Content Storage help article for more information. October 1, 2014 Update 274 • Added the MrssPosterSelect parameter to the Theme Editor to select which poster to use if an MRSS feed contains more than one poster for each item. September 29, 2014 Update 273 • Added scheduling support for Series List items in Grids to allow individual Grid items to be simulated live streams. • Added support for Itunes image elements in MRSS feeds. • Corrected a bug where apostrophes were incorrectly displayed in SHOUTcast album titles. August 12, 2014 Update 272 • Corrected a bug related to Vidillion ad tracking. Any channels built with Updates 264 through 271 which use Vidillion ads should apply Update 272 immediately. August 5, 2014 Update 271 • Added support for the ChannelAppId parameter to clickable banner ads, to permit linking to other Roku channels when the remote control OK or STAR key is pressed while the video ad is being played. See the Advertisements help article for more information. July 29, 2014 Update 270 • Corrected a bug that caused the channel to crash if the "Clear" or trashcan button in the Search screen was clicked before there was any search text to clear. July 25, 2014 Update 269 • Corrected a version 3.1 firmware compatibility issue affecting top-level Grid channels running on older (pre-2012) Roku devices. Does not affect Grids in Classic channel types. • Corrected a bug that caused the channel to crash if an MRSS item's Url parameter was blank. July 21, 2014 Update 268 • Added Brightcove Analytics support. • Added the Theme SpringboardVideoPlayAgainButton parameter with a default value of "play again" to allow modification of the play button label for items that have already been played. Previously the play button label for items that were already played was set by the SpringboardVideoResumeButton parameter which has a default value of "play from beginning". July 14, 2014 Update 267 • Increased the maximum size of video ad URLs to 5000 characters in order to support larger VAST tags. • No change to Brightscript code. July 8, 2014 Update 266 • Allow the special variables %CLOCK and %TODAY to be used in breadcrumbs. %CLOCK displays the local time, for example "9:01 PM". %TODAY displays the local date, for example "Monday, July 7, 2014". • Allow video ads to be associated with individual Grid Rows. • Corrected a bug that caused "UNKNOWN" to be displayed for both breadcrumbs in any new list created prior to updating an old channel to Update 264 or higher. June 27, 2014 Update 265 • Corrected a bug introduced in Update 264 that caused the channel to crash when attempting to play MRSS content under certain circumstances. June 26, 2014 Update 264 • Added the AllowSearch parameter to ads, which permits the Search function to be accessed while a video ad is playing. • Added the BreadcrumbLeft and BreadcrumbRight parameters to lists and video/audio items, which override the automatically-generated breadcrumb values controlled by the Theme Editor BreadcrumbEnabled and GridScreenBreadcrumbEnabled parameters. June 9, 2014 Update 263 • Added the ChannelAppId parameter to video ads, to permit linking to other Roku channels when the remote control OK or STAR key is pressed while the ad is being played. • Added the IgnoreVideoAdsEnabled parameter to video ads, to permit individual ads to override the global Theme Editor VideoAdsEnabled parameter. This permits non-ad content configured as an "Ad" item to be included in a premium channel where the content/ad would otherwise be excluded by the setting of the VideoAdsEnabled parameter. • Added the ShareRegistry parameter to the Theme Editor to allow channels with identical Roku Dev IDs (e.g. cloned channels) to have independent bookmarks, registration tokens, and other persistent data. This is applicable to clones published as separate channels, or to channels built from cloned "template" channels. • Allow ShortDescriptionLine1 and ShortDescriptionLine2 to be edited if a video is in a Grid, for use with the search feature. • Enabled the search feature (the remote STAR button) for Picture Screens, Text Screens, and Videos in AutomaticPlay-enabled lists with AutomaticPlayControls set to "pause" or "none" ("pause+skip" was already supported). • Adjusted video ad playback logic to more accurately report invalid URLs returned from ad providers. May 31, 2014 Update 262 • Added a customizable buffering progress bar to videos in AutomaticPlay-enabled Lists when the AutomaticPlayControls parameter is not set to "full". Multiple BufferBar parameters have been added to the Theme Editor to support color, size, and position options. • Improved error handling when videos in AutomaticPlay-enabled Lists become unavailable during playback due to network issues. The image pointed to by HDBufferPictureUrl or SDBufferPictureUrl and/or the AutomaticPlayBuffering text is now displayed during rebuffering events instead of the video screen. • Improved error handling when network issues occur during loading of S3 configuration files for individual content items. The Theme Editor UnavailableContent message is now displayed instead of attempting to continue to process the channel. • Corrected a bug introduced in Update 260 that prevented the Title from being displayed above the buffering progress bar for videos in Grid Rows containing only one video. May 22, 2014 Update 261 • Increased the number of search results beyond 9, and added a "more results" button to the Search screen. • Corrected a version 3.1 firmware compatibility issue affecting older Roku devices which limited search results to 1 item. • Added the Theme Editor SearchMoreResultsButton and SearchWaitLabel parameters. May 20, 2014 Update 260 • Added an optional search button to the Springboard/Detail screen, controlled by the Theme Editor SpringboardSearchButton and SearchScope parameters. • Corrected a bug introduced in Update 259 that caused the channel to exit to the Roku Home screen if the STAR key was pressed while in the Search screen. May 19, 2014 Update 259 • Added a channel-wide search function that is activated by pressing the STAR key on the remote control. New search-related parameters SearchScope, SearchBreadcrumbLabel, SearchHistoryLabel, SearchResultsLabel, SearchExitButton, SearchNoResults, SearchNoSearches, and SearchResultsLimit are located in the Theme Editor. • Modified springboard screen logic so that if the SpringboardVideoPlayButton parameter is blank, then the "Play" and "Play All" buttons will both use the SpringboardVideoPlayAllButton text for their button labels, and Series Lists will only be able to play all episodes, not individual episodes. May 12, 2014 Update 258 • Corrected a bug that caused an MRSS-generated Grid Row to use SD and HDListPosterUrl instead of SD and HDPosterUrl for the Grid artwork. • Minor changes to network retry logic for huge channels. May 5, 2014 Update 257 • Added the Theme Editor SpringboardEnabled parameter to allow Springboard/Detail screens to be optionally disabled, so that video items are played immediately after selection from a List or Grid. • Improved bookmark logic for Series Lists. • Display the Theme Editor UnavailableContent error message when trying to load a nonexistent playlist URL into a Grid Row. April 25, 2014 Update 256 • Corrected a bug that caused the channel to crash under certain circumstances when playlists were being loaded into a Grid Row and an unavailable video in the playlist was selected. April 9, 2014 Update 255 • Corrected a bug that caused the channel to crash under certain circumstances if Breadcrumbs were enabled and a Springboard was scrolled left or right. April 4, 2014 Update 254 • Added the Theme Editor AutomaticPauseTime, AutomaticPauseTitle, and AutomaticPauseBody parameters to allow AutomaticPlay-enabled Lists and live streams to be automatically paused if nobody is watching in order to conserve CDN bandwidth. • Corrected a bug that prevented the back button in an AutoPlay-enabled list from skipping over a Channel Programmable Button when the target channel was already installed. March 31, 2014 Update 253 • Added support for individual Brightcove video items in MRSS feeds using bc:// URLs. This is in addition to Brightcove playlist MRSS support that has been present since Instant TV Channel update 185. See the Brightcove and MRSS help articles for more information. • Added the gridrowtitle element to the Instant TV Channel MRSS specification. See the list of MRSS Elements for details. • Minor changes to Google Analytics logging of VAST ad tracker events. March 20, 2014 Update 252 • Corrects a problem with VAST ad processing that exists in previous updates 248 through 251. March 17, 2014 Update 251 • Added the ChannelSetupTimer parameter to Channel Programmable Buttons in order to facilitate cross-linking & advertising of other Roku channels in AutoPlay-enabled Lists. • Changed AutomaticPlayErrorEnabled parameter default to "True". • Modifications to AutomaticPlay processing to allow playback to continue when isPlaybackPosition occasionally provides inconsistent position information at the end of a video. March 5, 2014 Update 250 • Modified the logic for the Theme Editor AdOptimization parameter so that the parameter only applies to "preroll", "vast preroll", "vidillion preroll", "midroll", "vast midroll", "vidillion midroll", "postroll", "vast postroll", and "vidillion postroll" ad types. All other ad types are always randomized if there are multiple ads of the same type present at a particular level of a channel. • This update only affects developers with "Commercial" channels that contain video ads. March 3, 2014 Update 249 • Modified the VAST tracker URL handler to support a wider range of characters. • This update only affects developers with "Commercial" channels that contain VAST video ads. February 24, 2014 Update 248 Substantial changes related to video ads are included in this update. All developers updating a channel containing video ads should thoroughly test a private version of the channel to verify that video ads are working as expected before publishing the channel to the public Roku Channel Store. • Updated VAST video ad processing to support YuMe version 1.1.3. • Added the Theme Editor AdOptimize parameter to improve fill rate by selecting from multiple video ad providers until the ad request is filled or all providers have been tried. Options include "off", "random", and "ordered". • Added the Content Editor StartTime and AllowSkip parameters for video ads. See the Ads help article for more information. • Send the "Vidillion ad request" event message to Google Analytics for all filled and unfilled Vidillion ad break requests. Use in conjunction with the "No Vidillion ads available for this ad request" to calculate Vidillion fill rate. See the Google Analytics help article for more information. • Automatically limit Vidillion ad frequency as determined by the RepeatLimit parameter to a minimum of 5 minutes. February 9, 2014 Update 247 • Modified AutomaticPlay processing to allow playback to continue (the UnavailableContent dialog is not displayed) if a spurious Roku isRequestFailed message is generated at the end of a video. February 3, 2014 Update 246 • Added support for %hh-style escape sequences to allow the insertion of special characters into the AdBuffering parameter. For example, %0a will insert a newline character. This can be used to position the text or to provide multiple lines of text on ad buffering screens. • Content Editor MRSS passwords now protect the entire Playlist or Feed at entry, instead of the individual MRSS items. This is consistent with how passwords for Series Lists are already handled. • Added custom MRSS elements to support passwords on individual MRSS content items. See the MRSS Elements help article for details. • Modified the behavior of repeating AutoPlay-enabled lists so that the remote control REWIND key continuously loops through all content items instead of stopping when the first content item in the list is reached. • All AutoPlay lists now obey the PlayDuration parameter if it is provided. Previously only non-AutoPlay lists or AutoPlay lists with AutomaticPlayControls set to "full" obeyed the PlayDuration parameter. • Modified the handling of video ads so that preroll ads will be played even if the Video Content Item's PlayStart parameter is non-zero. Prior to this update if the beginning of a VOD item was skipped by using PlayStart then preroll ads would not play. • Corrected a bug that caused the channel to crash if the password screen within a Grid was exited without providing the password. January 27, 2014 Update 245 • Added the Theme Editor VideoAdsEnabled parameter to control the display of video ads for premium channels, and to allow separate premium (ad-free) and standard (ad-supported) channels to be maintained and synchronized from a single Instant TV Channel instance. See the Advertising help article for more information. • Added support for Brightcove Live HLS streams using the special bc:// URLs. See the Brightcove help article for more information. • Added the Content Editor TrackIdSubtitle parameter to support SMPTE-TT and 608/708 closed caption formats. • Corrected a bug where passworded MRSS Series in a Grid crashed the channel. January 14, 2014 • Enabled the use of the Content Editor PasswordEveryTime parameter for Horizontal, Vertical and Series list items, including the top channel-level list. Applies only to newly created items and requires an "Unlimited" or "Commercial" channel type. January 10, 2014 Update 244 • Enabled S3 content URLs to be used in MRSS feeds. See the MRSS Feeds and S3 Content help articles for more information. January 6, 2014 Update 243 • Updated bookmark behavior for AutomaticPlay-enabled lists so that the bookmark is cleared if a video item is played to within TailSeconds (Theme Editor parameter) of its end. This guarantees that the video item will restart from the beginning when a repeating AutomaticPlay list loops around and plays the item again. December 31, 2013 Update 242 • Corrected a problem where a black screen would occassionally display on top of a Grid screen in low device memory situations. December 30, 2013 Update 241 • Added the %VER query variable for use in content and video ad URLs. See the Query Variables help article for more information. • Added support for %hh-style escape sequences to allow the insertion of special characters into Title, ShortDescriptionLine1, and ShortDescriptionLine2 text fields. For example, %0a will insert a newline character. This can be used to position the text or to provide multiple lines of text when the Title or ShortDescriptionLine parameters are used with buffering screens. • Added the Theme Editor OverlayVideoOnly parameter to control the display of the overlay (logo bug) image with buffering and picture screens. If set to "True" then the overlay image only appears with non-ad video, but not on buffering or picture screens. Default is "False" in order to be consistent with previous behavior. • Enabled the use of the Content Editor PasswordEveryTime parameter for "New MRSS or Playlist" content items. • Enabled the use of the Content Editor HDOverLayUrl and SDOverLayUrl parameters for "New MRSS or Playlist" content items. • Corrected a problem where a black screen would occassionally display on top of Horizontal and Vertical lists in low device memory situations. December 4, 2013 Update 240 • Enabled the operation of the Theme Editor AdStartTime parameter. Although it has been present since Update 226, it had no effect on ad playback. See the Advertisements help article for more information. • Increased the number of allowable characters for the Content Editor Stream Url parameter from 256 to 5000. December 2, 2013 Update 239 • Added custom MRSS elements to support HD and SD versions of posters, BIF files, and ABR (Adaptive Bitrate) stream URLs. See the MRSS Elements help article for details. • Added the ScheduleTimeZone Theme Editor parameter to provide "gmt" and "local" timezone options for schedule-enabled lists. • Changed the Google Analytics Event Label for no-fill ad events from "Error" to "Status". See the Google Analytics help article for more information. • Modified the %SPLASH URL placeholder to handle .png and .gif splash images in addition to .jpg images. • Corrected a bug that caused scheduled monthly items to crash the channel under certain circumstances. November 14, 2013 Update 238 • Added the AutomaticPlay "repeat no-exit" option to the Content Editor. Loops an AutomaticPlay-Enabled list and prevents it from exiting unless the remote control HOME key is pressed. See the Automatic Playback help article for more information. • A minor change was made to how Vidillion URLs are generated. • Added the GoogleTrackingVideoHeartbeat parameter to the Theme Editor. Sends an event message to Google Analytics every 60 seconds while a video is being viewed so that the Google Analytics Real-Time "active visitors on site" figure and "Locations" map is accurate. See the Google Analytics help article for more information. • Improved responsiveness of remote control BACK and UP keys during processing of large linear playout schedules and large grids. • Corrected a bug introduced in Update 232 that caused the standard buffering screen for Series Episodes to be hidden even if there was no SD or HDBufferPictureUrl specified. November 11, 2013 Update 237 • Added the SHOUTcastEnabled parameter to the Content Editor. Allows SHOUTcast processing to be disabled for non-SHOUTcast audio streaming servers. See the SHOUTcast help article for information about using SHOUTcast with your Roku channel. • Added the playallbutton MRSS/XML element to allow custom MRSS feeds to control the display of the "Play All" button on Series Springboard/Detail screens. • Modified the Springboard/Detail screen Title field to contain both the Artist and Title parameters if the content is audio and the DescriptionStyle is not "audio". • Bookmarks within AutomaticPlay-enabled lists now restore the position within individual video items instead of always starting at the beginning of the last played item. • Changed the minimum value for the Content Editor Ad RepeatLimit parameter to 1 minute, and changed the default value to 5 minutes. • Added the Theme Editor AutomaticPlayErrorEnabled parameter to optionally display the UnavailableContent error message if a problem occurs during playback of a video in an AutomaticPlay-enabled list. • If Vidillion video ads are in use in a channel, all video playback errors, including errors that occur in Ads and in AutomaticPlay-enabled lists, will display an UnavailableContent error message. • Prevent the Registration and Linking screen from appearing until after the splash screens and splash video have completed. • Added the Content Editor PasswordEveryTime parameter. If "True" requires that a password be entered every time instead of being remembered. • Changed the Google Analytics "Event Label" parameter, which was a duplicate of the "Event Action" parameter, to track the Content Editor ContentID of VAST and Vidillion ads. November 7, 2013 Update 236 • Added support for audio track metadata, including album artwork, when using SHOUTcast live audio streams. See the SHOUTcast help article for more information. • Added the Last.fm API Key parameter to the Keys & CDNs page to provide access to Last.fm Web Services. • Added the SpringboardRuntimeLabel and SpringboardReleaseDateLabel parameters to the Theme Editor. • Added the URL placeholder %SPLASH which can be used to quickly redisplay the channel's splash image as a Picture screen (with HDPictureUrl or SDPictureUrl) or as a Buffer screen (with HDBufferPictureUrl or SDBufferPictureUrl). • Corrected a bug that may cause the channel to crash when the video being played is within a list or grid created prior to update 220. October 31, 2013 Update 235 • Modified the handling of midroll video ads so that the behavior of the SDBufferPictureUrl, HDBufferPictureUrl, and BufferPictureTimer parameters are consistent with their behavior for preroll and postroll video ads. • Added the BufferPictureTextEnabled parameter to the Theme Editor to control the display of Title and AutomaticPlayBuffering text on top of images specified by the SDBufferPictureUrl and HDBufferPictureUrl parameters. • Added support for the BufferPictureTimer parameter to VAST video ads and Vidillion video ads. • Added a check for BACK and UP remote control requests while waiting for the BufferPictureTimer to expire. October 25, 2013 Update 234 • Corrected a bug where a video ad with no AdBuffer text and no BufferPictureURLs may cause the channel to become non-responsive if the user clicks BACK or UP during the video ad buffering period. October 24, 2013 Update 233 • Added the VerticalTitle parameter to Lists, Picture and Text items, MRSS Feeds and Programmable Buttons that are children of Vertical Lists. Used along with ShortDescriptionLine1 to allow separate text strings to be displayed for the selectable items and beneath posters in Vertical Lists. Video and Audio Content Items continue to use the Title and ShortDescriptionLine1 parameters for this purpose. • Corrected a bug where a "Back" Programmable Button may cause the channel to become non-responsive. October 18, 2013 Update 232 • Prevent the Splash screen from reappearing after the optional Splash video is played. • Display the optional HDBufferPictureUrl and SDBufferPictureUrl images even if the Stream Url parameter is %NULL. • Added the URL placeholder %BLACK which can be used to quickly display a solid black Picture (with HDPictureUrl or SDPictureUrl) or Buffer screen (with HDBufferPictureUrl or SDBufferPictureUrl). October 17, 2013 Update 231 • Added support for Brightcove Live HLS streams. • Removed unnecessary "Wait" box which appeared at channel launch under certain circumstances. October 15, 2013 Update 230 • Added a special Stream URL %NULL which can be used to play preroll and postroll ads without playing a corresponding Video Content Item. • Added special URLs pkg:/images/splash_hd.jpg and pkg:/images/splash_sd.jpg which can be used redisplay the Splash image as a Buffer or Picture screen. The URL's extension must be .jpg, .png or .gif to match the uploaded Splash image's filename extension. • Bug fix correcting a problem where a bad URL or video encoding may cause an AutomaticPlay-enabled list to exit prematurely. October 14, 2013 Update 229 • Improved the internal handling of Picture screens (equivalent to the Roku SDK roImageCanvas) to reduce brief black screens that appear throughout the channel between other screens. • Added support for additional Vidillion URL formats for preroll, midroll and postroll video ads. • Bug fix correcting a problem where the AutomaticPlayTextColor parameter was ignored under certain conditions. October 9, 2013 Update 228 • Eliminated the brief black screen that appeared immediately after the Splash screen. • Added Vimeo support to the Theme Editor splash_video parameter. • Bug fix for the Programmable Button "Channel" function, resolving a problem caused by Update 226. • Bug fix (again) for Picture screens that occasionally detected a phantom OK remote key press. October 7, 2013 Update 227 • Added a scrolling option for Text Screens. • Added Video Ad Position %POS and Content URL %URL Query Variables for use with video advertisement URLs. • Bug fix to prevent the remote control PAUSE key from briefly freezing the video screen on older Roku models when AutomaticPlayControls is set to "None". • Bug fix to prevent invalid Vidillion ad URLs from crashing the channel. October 4, 2013 Update 226 • Added support for Vidillion preroll, midroll, and postroll ads. • Added "Midroll" and "Midroll2" options to the AdType parameter for Ads. • Added Midroll Position parameters for video items. • Added SDBufferPictureUrl, HDBufferPictureUrl and BufferPictureTimer parameters to Ad, MRSS and Video Content Items in order to allow buffering screens to be hidden without using Picture Screens. • Added the AdStartTime to the Theme Editor. Determines the minimum number of minutes to wait after the channel is launched before playing the first ad. • Changed internal handling of zero hh:mm:ss length to eliminate "0m" display on Springboard screens. • Overlay images now shown in the Content Editor poster window. • Bug fix for Picture screens that occasionally detected a phantom OK remote key press. • Bug fix to prevent Picture screens from crashing the channel when scheduling and Google Analytics are used at the same time. • Bug fix to prevent "preroll" and "postroll" ads from occasionally being played instead of "preroll2" and "postroll2" ads. • Bug fix for a problem introduced in update #213 related to grid loading optimization when a Grid Row has been previously bookmarked. • Bug fix for problem where a top-level AutomaticPlay-enabled list with a nested Schedule-enabled list could cause a stuck black screen when exiting the Schedule. September 12, 2013 Update 224 - 225 • Bug fix for nested Vertical Lists. Unlimited nesting of Vertical Lists with ListStyle set to "vertical-background" is now possible. • Added support for query variables %RND, %SEQ, %TIME, %TOKEN, %DEVID, %MODEL, %FWVER, %DTYPE and %DMODE used in content and video ad URLs. See the Query Variables help article for more information. • Re-added support for AutoPlay (AutomaticPlay set to "once" or "repeat") MRSS feeds and playlists used as Series Lists within Grids which was inadvertently dropped from Update #221. • Update, repackage and upload to your Roku Developer Account are required to add these updates to your Roku channel. September 9, 2013 Update 223 • Added the SpringboardSubtitleDefault, SpringboardSubtitleOffButton, and SpringboardSubtitleOnButton parameters to the Theme Editor to control the text displayed on the Springboard/Detail screen's Subtitles button when video subtitles are used. • Added the Theme Editor EraseRegistry parameter to assist with testing persistent variables like bookmarks and passwords. • Changed the behavior of the Roku remote control REPLAY button when used in an AutomaticPlay list. If the AutomaticPlayControls parameter is not "full", the REPLAY button will now rewind to the position (in seconds) specified by PlayStart instead of rewinding all the way to position 0. September 7, 2013 Update 222 • Bug fix to prevent channel from crashing if all rows in a grid have DoNotDisplay set to "True". • Bug fix for nested AutoPlay List premature exit issue introduced in Update #220. • Bug fix to prevent Content Editor from displaying Overlays in AutoPlay Lists with AutomaticPlayControls set to "Full". • Changed how the Content Editor displays Programmable Button icons when used with the DoNotDisplay parameter. September 5, 2013 Update 221 • Improved loading speed for MRSS feeds used as Series Lists within Grids. • Added the SpringboardLeftRightEnabled parameter to the Theme Editor, which allows the remote control left and right buttons to be disabled in Springboard screens. September 3, 2013 Update 220 • Added a "schedule" option to AutomaticPlay which allows a channel to act as a playout server by generating a live stream using video-on-demand content. See the Automated Playout help article for details. • Added "daily", "weekly", "monthly", "leader", "follower", "filler", and "relative" scheduling options for all Content Items when AutomaticPlay is set to "schedule". • Added an on-screen Programmable Button item that has five selectable functions: "back" (identical to the BACK button on a Roku remote control), "exit level" (exit the current level or list), "top" (jump to the top of the channel), "home" (identical to the HOME button on a Roku remote control), and "channel" (jump to another channel). See the Programmable Buttons help article for more information. • Added Comment and Notes parameters to all Content Items. • Added Color, Position, and Font Size options for Automatic Play buffering text. • Added support for %hh-style escape sequences to allow the insertion of special characters into Roku multi-line text fields. For example, %0a will insert a newline character. • Allow banner, preroll and postroll ads to be specified within Series Lists. • Changed behavior of the PlayDuration parameter so that it stops video playback instead of only affecting the maximum time shown on the progress bar. • Removed the unnecessary PictureLoadingTimer parameter from Picture Screen items. • Automated Content Editor synchronization of ShortDescriptionLine1 with Title. • Changed the remote control BACK button behavior so that it completely exits all nested AutomaticPlay levels instead of just one level. • The Header parameter of a Vertical List is now used as the List's selectable Title when its ShortDescriptionLine1 parameter is blank and the List is nested inside another Vertical List. • Corrected a bug that caused channels to crash if a Series List's "choose a new episode" button was selected when the ListStyle parameter was set to "arced-landscape" or "flat-category". • Corrected a bug which caused the Content Editor to hang when trying to delete a content tree item with a blank name. • Corrected a bug related to Brightscript's Rnd() function not working correctly when generating temporary file names for grid posters. • Corrected a bug related to ad timing which prevented ads from running under certain conditions. June 28, 2013 • Increased the maximum Theme Editor file upload size from 100K to 200K in order to accomodate larger splash images. • Corrected a bug that caused the Content Editor to be displayed incorrectly when changing the browser zoom level. Content Editor display problems may still occur with extremely small browser zoom levels. June 25, 2013 • The numbering system used for Pkg files has been updated to incorporate the major and minor version numbers along with the build version number. This may require you to manually increment the build_version number in the Theme Editor if you need to re-download an existing Pkg file that has the old numbering system. • Added a Developer Mode setting to the Account page. "Basic" Developer Mode displays only the most commonly used parameters in the Theme and Content editors. "Advanced" Developer Mode displays all parameters in the editors. June 25, 2013 Update 219 • Changed the Content Editor HDBranded parameter default value to False. • Added support for HLS and M4V VAST preroll and postroll ads requested by YuMe. • Added automatic centering for Splash screens and Picture screens if the X and Y offsets are "0". • Corrected a bug introduced several updates ago which caused the splash screen color to be ignored for non-Commercial channels. June 13, 2013 Update 218 • Added the ListScreenHeaderText color parameter to the Theme Editor. • Minor modifications to the Content Editor. • An update is required to add the new Theme Editor parameter to your Roku channel. Repackaging and uploading to your Roku Developer Account are not required. June 12, 2013 Update 217 • Display an error message if a channel is deleted from its Instant TV Channel account. This message was already present but was inadvertently hidden by the splash screen as of update 203. June 10, 2013 • Minor modifications to the Content Editor. June 7, 2013 Update 216 • This update replaces the default poster URLs and splash screen. May 29, 2013 • Renamed "Instant Roku Channel" to "Instant TV Channel". May 14, 2013 Update 215 • Eliminated an intermittent problem where the splash video began playback a few seconds before the splash screen was removed on pre-Roku 2 devices. This update is only necessary for Commercial channels using a splash video following the splash screen. May 8, 2013 Update 214 • Changed the behavior of the remote control Back and Up buttons in AutoPlay postroll ads so that they exit to the menu instead of continuing with the next ad or list item. May 3, 2013 Update 213 • Added the AdBuffering parameter to the Content Editor to allow the display of custom text for each ad while it buffers. • Adjusted the behavior of the Theme Editor's AdRepeatLimit parameter so that it applies separately to each of the 4 video ad types. • Added automatic bookmarking for Grid Rows. April 29, 2013 Update 212 • Corrected a bug introduced in update #210 where preroll ads from higher-level lists or folders are ignored for videos in lower-level lists or folders. This bug only affects Commercial channels using preroll ads. • Added 2 new preroll and 4 new postroll AdType options to the Content Editor. • Added the PostrollBuffering parameter to the Theme Editor. April 26, 2013 Update 211 • Corrected a bug where sequentially viewing multiple live streams causes the Roku device's Springboard screen to freeze under certain conditions. This bug only affects channels using video with the Live Content Editor parameter set to "True". April 24, 2013 Update 210 • Loading speed improved. • Corrected several bugs related to Content Editor reports. April 15, 2013 Update 209 • Added the global SingleItemListBypass parameter to the Theme Editor. This parameter allows Horizontal Lists that contain a single item to be bypassed directly to the detail/Springboard screen of the single item. • Brightcove URL-enabled tokens may now be included in bc:// URLs, which will override any token specified on the Instant TV Channel Keys & CDNs page. See the Brightcove walk-through for more information. April 5, 2013 Update 208 • Added a Brightcove Parameter Override option to the Keys & CDNs page that allows Instant TV Channel Content Editor parameters, if present, to override Brightcove parameters. • Added Instant TV Channel-specific Elements to the MRSS playlist XML parser to permit population of more Roku-specific parameters than is possible with common MRSS variants and extensions. • Corrected a problem where live mp3 audio streams sometimes took an excessively long time to buffer. • Display only the 4-digit year if the ReleaseDate parameter for an MRSS feed or playlist is in ISO-8601 ("2012-01-01T12:00:00Z") format. March 25, 2013 Update 207 • Added the HDOverlayUrl and SDOverlayUrl parameters to the Content Editor. Displays a watermark bug/logo in lists with AutomaticPlay enabled if AutomaticPlayControls is set to False. • AutomaticPlayBuffering and AutomaticPlayText parameters now control the buffering text regardless of the AutomaticPlayControls setting. Delete the default AutomaticPlayText parameter value to restore the previous behavior of no buffering text when AutomaticPlayControls is set to false. • Added optional Vertical List breadcrumbs for Roku2 Firmware 4.8 and later devices. Corrected a bug preventing the playback of Brightcove playlists that was accidentally introduced in update #206. March 18, 2013 Update 206 • Improved grid loading speed. March 11, 2013 Update 205 • Added an optional Exit / Menu button to springboard screens. • Improved optional splash video screen compatibility with Roku3 devices. Commercial channels with splash page artwork smaller than 1280x720 or 720x480 may need to adjust splash X and Y parameters after applying this update. • Update, repackage and upload to your Roku Developer Account are required to add this patch to your Roku channel. March 4, 2013 Update 204 • Corrected a bug introduced in Update 203 where displaying the optional Debug screen caused the channel to exit afterward if only a single splash screen was shown. This only affects channels that have the Theme Editor ShowDebugInfo parameter set to "Yes". February 25, 2013 Update 203 • Addressed the splash screen issue discussed in the Roku Developer Forum concerning the manifest file. Splash screens on Roku2 devices appear instantly when the channel is started, eliminating the previous 2 to 3 second delay. Splash screens on older devices are unchanged. • You may need to re-enter your splash screen parameters after applying this update. • Update, repackage and upload to your Roku Developer Account are required to add this change to your Roku channel. February 14, 2013 Update 202 • Improved specific content provider compatibility in order to reduce the likelihood of required updates in the future. • Changed the Content Editor HDBranded parameter default value to True. • Update, repackage and upload to your Roku Developer Account are required to add the content provider compatibility change to your Roku channel. February 14, 2013 Update 201 • Improved specific content provider compatibility. • Added the splash_video parameter to the Theme Editor. • Allow vertical_background to be used for ListStyle parameter within non-top-level Vertical Lists. • Corrected a bug that caused the channel to exit when parsing a badly-formatted poster URL. • Update, repackage and upload to your Roku Developer Account are required to add these changes to your Roku channel. January 28, 2013 Update 200 • Improved specific content provider compatibility for playlists used as MRSS feeds. • Improved compatibility for Dropbox URLs used for streams and posters. • Corrected a bug that may prevent a Picture item from being used in an Automatic Playback enabled list. January 23, 2013 Update 199 • Added new Content Editor tree icons to indicate the status of the DoNotDisplay and AutomaticPlay parameters. • Corrected a bug that prevented the splash screen from being displayed properly if the top level of the channel had the AutomaticPlay parameter set to either once or repeat. Otherwise the splash screen displayed correctly. • Update, repackage and upload to your Roku Developer Account are required to add the splash screen patch to your Roku channel. The Content Editor icon change does not require any action. January 16, 2013 Update 198 • Allow specific content provider URLs to be used as preroll ads. January 15, 2013 Update 197 • Loading speed enhancements. May provide noticeable loading speed improvement for larger channels. • Display the custom splash screen for Commercial channels earlier in the boot sequence. January 14, 2013 Update 196 • Corrected a bug preventing Selectable Banner Ad playback that was introduced in Update 195. January 7, 2013 Update 195 • Added the AutomaticPlayBuffering and AutomaticPlayText parameters to provide control over the buffering bar text for Lists and MRSS Feeds with AutomaticPlay enabled. January 5, 2013 • Added hls (HTTP Live Streaming) support for MRSS Feeds. Previously MRSS Feeds would be unplayable if the StreamFormat parameter was changed from the default mp4 to anything else. January 4, 2013 Update 194 • Added the global AdRepeatLimit parameter to the Theme Editor. Prevents any preroll video from being replayed within a specified time limit. Does not affect banner ads. • Added the ListItemHighlightHD and ListItemHighlightSD parameters to the Theme Editor to provide customization of Vertical List item highlight image. January 3, 2013 Update 193 • Added the RepeatLimit parameter to video advertisements. Prevents individual preroll videos from being replayed within a specified time limit. Does not affect banner ads. • This update only affects Commercial channels that contain preroll videos. December 31, 2012 Update 192 • Lists with Automatic Playback enabled (including MRSS Feeds and Playlists) will skip invalid URLs and continue with the next valid URL instead of exiting Automatic Playback mode. • This update only affects Lists that have Automatic Playback enabled. December 28, 2012 Update 191 • Added the Brightcove Maximum Height parameter to the Keys & CDNs page to work around any 1080p encoding problems. Set to 1079 or lower to prevent 1080p rendition selection, otherwise set to 1080 or higher to allow normal rendition selection. • Bookmark the video playback position even if remote Home button is pressed. Previously playback position was not saved if the Home button was pressed while a video was playing. • Removed PositionNotificationPeriod from Theme editor. Internal value now used is always 1 second. December 20, 2012 Update 190 • Added episode numbers to MRSS Feeds and Playlists with Episodic displays. • Added the EpisodeSynopsisColor parameter to the Theme Editor. • Both changes only affect MRSS Feeds and Playlists that have a ListStyle of flat-episodic or flat-episodic-16x9. December 19, 2012 Update 189 • Improved specific content provider compatibility. • Video preroll ads can now be used in Grid channels. Ads were previously available for Grids, but not for top-level Grid channels. • New Theme Editor parameter GATrackingLogExit re-enables Google Analytics tracking of channel exit event which was inadvertently removed in Update 188. • Picture, Text, and Grid titles now appear correctly in Vertical Lists. • HDSmallIconUrl and SDSmallIconUrl now available for all child items in Vertical Lists, defaults provided by Content Editor. December 18, 2012 Update 188 • Text and Picture item ShortDescriptionLine 1 and 2 are displayed in the item's Grid call-out box (instead of Title and Description which do not exist for Text and Picture items) when Text or Picture items are used in a Grid. • Changed Brightcove API requests to use encryption for token protection. • HD icon that appears next to quality dots is now displayed if a multi-bitrate MP4 URL stream is 720p or higher and HDBranded is set to True. This overrides the Quality parameter and also determines if the stream is available for SD displays. • Cleaned up screen sequencing to eliminate occasional between-screen flashing. • Removed unnecessary "Retrieving" message when channel is exited. • Removed unnecessary IsHd parameter from Content Editor. • Improved remote control responsiveness during loading of large (100s of items) MRSS feeds on slower pre-Roku2 devices. December 14, 2012 Update 187 • Display the focused item's Description parameter in MRSS or Playlist roPoster (selection) screens that have a ListStyle of flat-episodic or flat-episodic-16x9. • Corrected a bug where "- Not Selected -" was displayed as the Springboard movie rating when no rating was selected. • Added automatic multi-bitrate capability for specific content provider instead of always playing the highest bitrate video. • Changed operation of remote control Back button on Text screens (see previous update). • Removed unnecessary screen flashing that occurred when nesting non-autoplay lists within autoplay lists. December 11, 2012 Update 186 • Changed operation of remote control Back button when used in Automatic Playback screens without on-screen controls to conform with Roku's standard action of exiting playback. The remote control Rewind and Fast-Forward buttons retain their original functions in Automatic Playback screens without on-screen controls of skipping back or ahead by one video. This update was requested by Roku but is only required if you are using Automatic Playback within a public channel. December 10, 2012 Update 185 • Added support for Brightcove's Video Cloud platform. • Added video ad preroll support to Grids. • Removed the annoying flashing screen that occurred when attempting to play a broken Stream Url. • Swapped "User Defined Value" and "Event Label" Google Analytics parameters. December 5, 2012 Update 184 • Improved specific content provider compatibility for playlists used as MRSS feeds. • Corrected a bug that prevented exit from nested autoplay lists. November 30, 2012 Update 183 • Updated Instant TV Channel's WordPress plugin to support registration expiration, subscriber messaging, multiple simultaneous widgets, limiting the number of registered Roku devices per subscriber, and limiting the number of renewals per device. • Added support in Brightscript for the updated WordPress plugin. • Added password and registration support to Picture and Text content types. November 26, 2012 Update 182 • Added a "preroll" option for ads, including VAST support, for Horizontal and Vertical Lists. • Improved start-up performance for slow or congested Internet connections. • Added the reload parameter to the Picture content type for use with webcams. • Removed Resume button from Springboard screen when content Length is not provided and content has played through to end. • Corrected minutes remaining displayed on Resume button when minutes remaining are greater than 60. November 15, 2012 Update 181 • Compatibility update for pre-Roku2 devices, correcting a bug affecting update 180. • Update, repackage and upload to your Roku Developer Account are required. November 8, 2012 Update 180 • Added a new "Picture" content type which provides a jpg, png or gif picture screen and optional delay timer in any horizontal or vertical list, including Automatic Play enabled lists. • Added a new "Text" content type which provides a multi-paragraph text screen, optional delay timer, and optional button in any horizontal or vertical list, including Automatic Play enabled lists. • Added the AutomaticPlayControls parameter to display the standard buffering bar and on-screen controls on AutoPlay screens. Default is True (on). October 25, 2012 Update 179 • Modified AutomaticPlay so that "bad" URLs are skipped without displaying an error message. October 16, 2012 • Changed the "Channels Served" banner at the top of the Instant TV Channel web site so that it excludes channels that haven't been packaged for upload to the Roku Channel Store. October 14, 2012 Update 178 • Corrected a Brightscript bug preventing URLs from being used as theme items including banner logos. • Update, repackage and upload to your Roku Developer Account to apply this patch to your Roku channel. October 4, 2012 Update 177 • Added the DoNotDisplay option to all Content Types. Useful for temporarily removing a Content Item, List or Grid from a channel without deleting it from the Content Editor. • Update, repackage and upload to your Roku Developer Account are required to add this change to your Roku channel. Only affects new channels or new items added to existing channels. Items already in an existing channel will not have DoNotDisplay available. October 2, 2012 Update 176 • Improved specific content provider compatibility for MRSS feeds. • Improved error handling when content URL is invalid. October 1, 2012 Update 175 • Added support for Vertical Lists (roListScreen in the Roku SDK). • Added a new top-level channel type, "Vertical". • Corrected stuck breadcrumbs in Springboard bug (breadcrumbs displayed even if EnableBreadcrumbs was false). • Corrected MRSS in Lists bug (could not have an MRSS feed in a list). • Revised Content Editor icons for Horizontal Lists and Series . September 15, 2012 Update 174 • Cleaned up specific content provider URLs reported to Google Analytics. September 14, 2012 Update 173 • Corrected problem with Google Analytics visitor tracking. • Corrected problem with UI responsiveness when Google Analytics is enabled. • Improved specific content provider compatibility. • Added audio-only (MP3) content AutoPlay pause capability. September 4, 2012 Update 172 • Added Google Analytics tracking. See http://www.InstantTvChannel.com/roku/analytics for more information. • Update, repackage and upload to your Roku Developer Account are required to add Google Analytics tracking to your Roku channel. August 28, 2012 Update 170-171 • Removed progress bar from AutoPlay / Automatic-Play. • Improved remote keypress functions for AutoPlay / Automatic-Play. • Added support for non-US S3 buckets using Instant TV Channel S3:// URLs. • Update, repackage and upload to your Roku Developer Account are required to add these features to your Roku channel. August 22, 2012 Update 169 • Corrected regression bug related to responsiveness of Grid UI. August 21, 2012 Update 167 • Renamed "Linear List" to "Horizontal List" in the Content Editor in order to align Instant TV Channel terminology with Roku terminology, and in preparation for support of Vertical Lists (based on Roku's roListScreen) in a future update. This article attempts to clarify the terminology. • Added the AutomaticPlay Content Editor parameter for use with lobby and kiosk loop applications, or to "daisy chain" multiple short videos together into a single long video. Applicable to Horizontal Lists, Series, and MRSS Feeds. • Corrected problem in Brightscript code related to handling of SSL poster URLs. • Improved poster loading speed. August 10, 2012 Update 166 • Corrected problem in Brightscript code related to Registration and Linking when the optional Partner Id was not provided. • Added the EraseDeviceToken parameter in Theme Editor to assist with testing Registration and Linking. • A WordPress plug-in that implements Registration and Linking is available here. August 7, 2012 Update 165 • Updated Content Editor template. ShortDescriptionLine2, displayed on Roku devices as the description in Grid callout boxes, is now editable for MRSS Feeds located within Grid Rows. August 3, 2012 Update 164 • Corrected Content Editor template. Initial MRSS Feed HD PosterStyle (the poster displayed for MRSS items if the MRSS feed does not specify its own poster) recommended size was for SD dimensions instead of HD dimensions. The correct HD dimensions were displayed if the PosterStyle selection was changed. This has no effect on actual channel content, this only affects the recommended MRSS poster size displayed in the Content Editor. August 1, 2012 Update 162 • Improved UI responsiveness during loading of huge RSS / MRSS feeds. • Added password control to RSS / MRSS feed items. • Added registration & linking control to RSS / MRSS feed items. • Improved bookmark handling for Series / Episode lists. • Updated default Grid overhang slice images. July 30, 2012 Updates 154-157 • Added support for RSS / MRSS content feeds in Grids and Grid Rows. • Added "Display As Series" feature to RSS / MRSS feeds. • Optimized RSS / MRSS loading speed. • Fixed problem with Dropbox HTTPS content. July 25, 2012 Updates 152-153 • Added support for RSS / MRSS content feeds. July 17, 2012 Updates 150-151 • Added optional PLAY ALL button to episode springboard. • Added support for Audio Content Items within Grid lists. July 14, 2012 Updates 148-149 • Added support for HTTPS (including S3) list posters. July 12, 2012 Updates 145-147 • Corrected behavior of Series lists inside Grid lists. July 4, 2012 Update 144 • Initial public release.